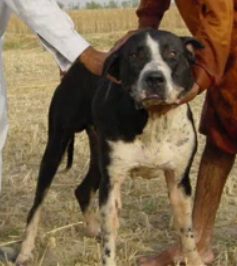 Game line Naggi and Succha Bully Kutta from Gaddi x Araioon Wala bloodines. Dozer is currently maturing in the traditional Pakistan way in his homeland and will be producing offspring to be the first imported Bully Kuttas here in the U.S.A.
Dozer is a lively, very handsome and nicely structured chocolate Bully Kutta that even at four weeks has excellent shape and bones for a Bully Kutta. Araioon Wala Kaala 3 time winner at only 2 years old and is 34 inches at the withers. 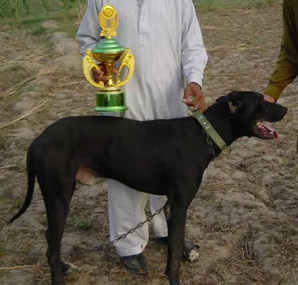 Bijli, who is 32 inches at the withers, is from Gaadi Bloodline Sired by : Zafar Gaadis "Dabba" 10 champion titles, retired unbeaten champion with sire Araioon Wala Chaanga, 7 time champion retired unbeaten. Additional photos of parents in slideshow.